Urban design enables better places to be created for people and is thus seen in Urban Design in the Real Estate Development Process as a place-making activity, rather than the application of architectural aesthetics. Urban design policy can change the 'decision environment' of developers, financiers, designers and other actors in the real estate development process to make them take place-making more seriously. 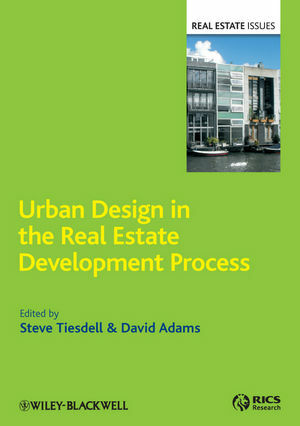 This book reports diverse international experience from Europe and North America on the role and significance of urban design in the real estate development process and explores how higher quality development and better places can be achieved through public policy. The book is focused on four types of policy tool or instrument that have been deployed to promote better urban design: those that seek to shape, regulate or provide stimulus to real estate markets along with those aim to build capacity to achieve these. Urban design is therefore seen as a form of public policy that seeks to steer real estate development towards policy-shaped rather than market-led outcomes. The editors set the examples, case studies and evidence from international contributors within a substantive discussion of the impact of urban design policy tools and actions in specific development contexts. Urban design can add value to the benefit of developers and cities as a whole.